The ADAPTA’s DNA has its roots in IMA’s 50 years of experience and more than 5,000 capsule fillers worldwide. 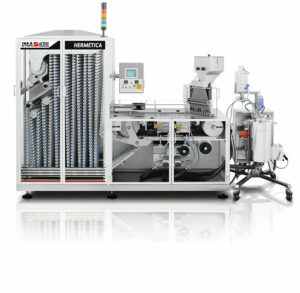 Multi product dosing at high speed, flexible configuration, 100% weight control are the hallmarks of a machine which is unique in the market. 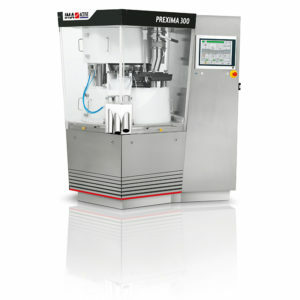 Conceived to provide the highest efficiency in the field of automatic coating equipment, PERFIMA guarantees remarkable performance with all processes. 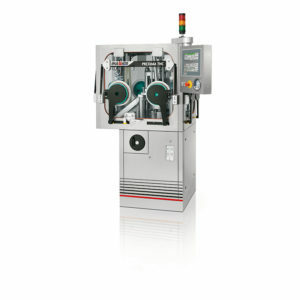 Also suitable for containment installations, the machine reduces operator exposure while working with HAPI. 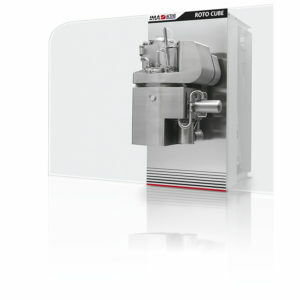 Developed in 1984, ROTO CUBE is the benchmark for single-pot granulation. 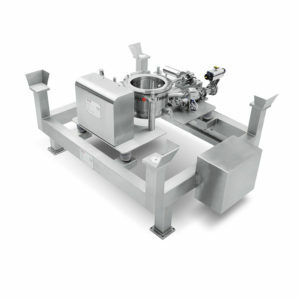 Accurate detection of the wet granulation end-point, tilting bowl and gas stripping (GA.ST.) 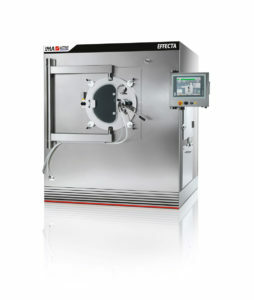 during vacuum drying all ensure highly efficient processes and premium quality granules. High efficiency with minimum consumption. 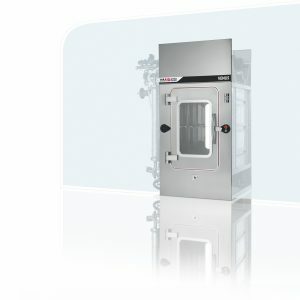 Available in three models, ATLANTIS ensures optimal performance with maximum flexibility in terms of machine configurations and washing cycles. Versatility and high performance are the hallmarks of IMA Active’s bin tumblers. 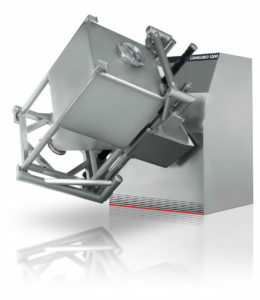 CYCLOPS ensures efficient mixing thanks to its 15° rotation axis while minimising the need for tumbler decontamination. Simple, reliable and effective, PRACTICA is the unbeatable answer to a wide variety of straightforward capsule filling requirements. A competitive solution in terms of speed, precision and ease of use. Engineered simplicity is hard to beat. 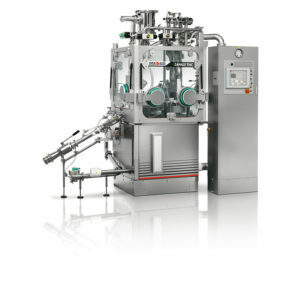 A combination of IMA Active’s technological expertise and knowledge of the pharmaceutical industry, VENUS achieves top-level performance while minimising water and detergent consumption thanks to its recirculation system. Shaping washing to your needs. 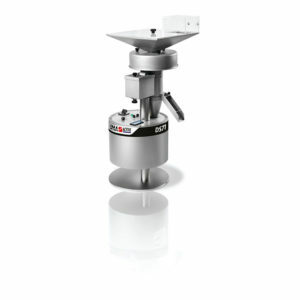 MINIMA is a table-top capsule filler designed to dose DPIs or solid products for oral administration in hard capsules. 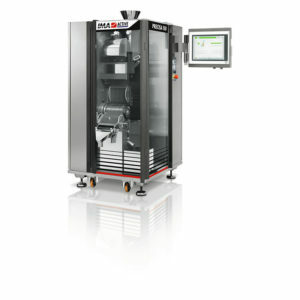 Highly precise and with a single dosator, MINIMA can work with all capsule sizes and any dosage, as it can be equipped with all the dosing devices of standard production machines. No system can obtain the maximum Occupational Exposure Level without washing its valves. 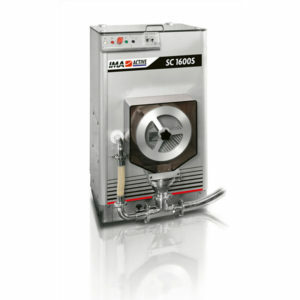 TWINVALVE combines IMA Active’s experience in powder handling and washing systems to ensure high containment. Designed for total high containment, PREXIMA THC ensures high flexibility with maximum reliability. 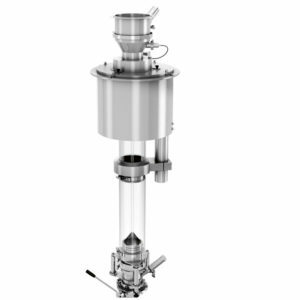 Easily integrated with other equipment, PREXIMA THC fits seamlessly into solid dose processing lines. 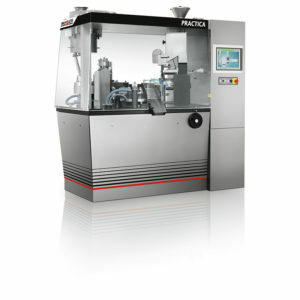 Designed with an extremely compact layout to save space in the production area, PRECISA combines very high production speeds with an outstanding weighing system in terms of precision. MYLAB is an essential tool to select the most appropriate technology for your products. 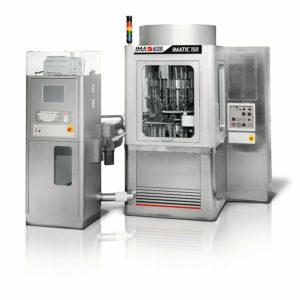 Must-have equipment also for formulation and scale-up studies to easily achieve production requirements. 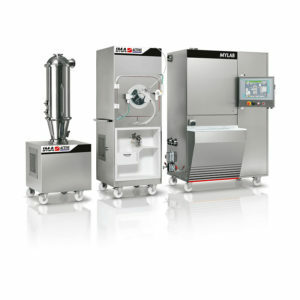 ROTO MIX is the latest generation high shear granulator. 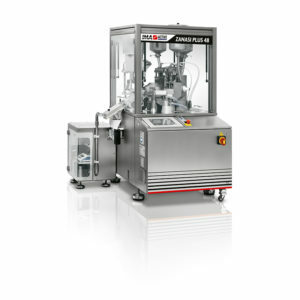 Inspired by the consolidated Roto technology existing in the pharmaceutical industry since the 1980s, ROTO MIX ensures the optimum shear for granulation at all speeds. 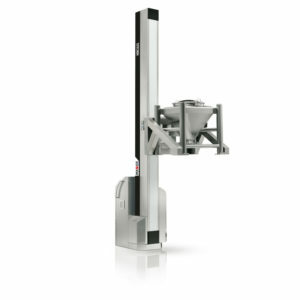 HERCULES is IMA’s latest generation of lifting columns. Available in three different models, HERCULES is equipped with the certified Blocstop™ system to ensure optimal safety with maximum resistance. 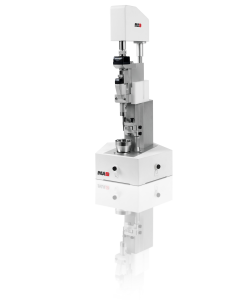 Launched on the market in 1995, COMPRIMA is still the state of the art in tableting thanks to its innovative compression system. COMPRIMA ensures yields up to 99.5% with maximum tablet quality. Leading the way in tableting. Suitable for tamper-evident capsule sealing, HERMETICA, born from experience that began in the 1970s, has an ergonomic layout guaranteeing maximum visibility and best accessibility to each phase of the process. The key for perfect capsule sealing. 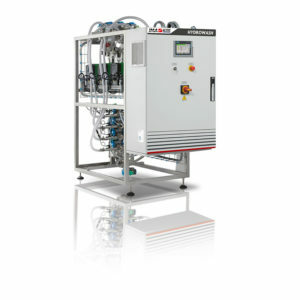 Premium quality engineering is the hallmark of IMA Active’s fluid bed processor. 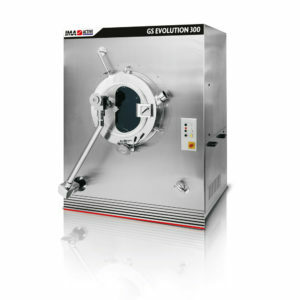 Thanks to its smart design for filter inspection and filter change, GHIBLI ensures maximum efficiency in drying, granulation and pellet coating. Flexibility is the hallmark of IMA Active’s handling systems. 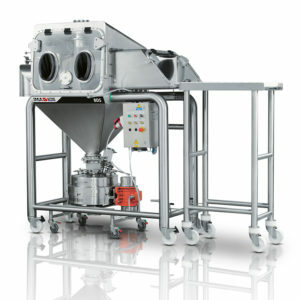 Easily integrated with other equipment into solid dose processing lines, TWISTER allows product transfer in high containment. Enhancing the quality of your products. Designed in the 1970s, ZANASI and ZANASI PLUS are IMA’s first automatic capsule fillers to have made history. Still sought-after for their simple configuration, they offer maximum versatility in terms of combined dosing within the same capsule. The capsule fillers that made history. GS Coating Equipment features innovative technology with an awareness of the issues related to environment, energy saving and reliability. 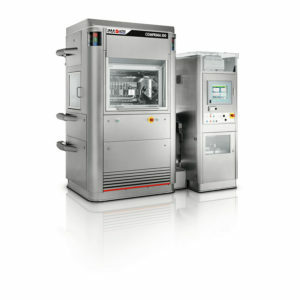 Available in different models, GS machines allow the processing of all product sizes. The coating pan that made history. 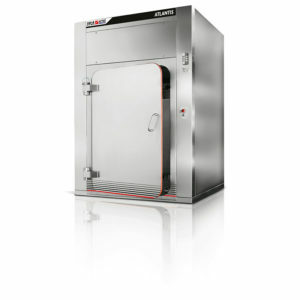 High efficiency and compact design. Easily positioned inside the working area, HYDROWASH is designed in compliance with the highest GMP standards for installations with sanitary water. Simple design, reduced dimensions, accurate finishing. 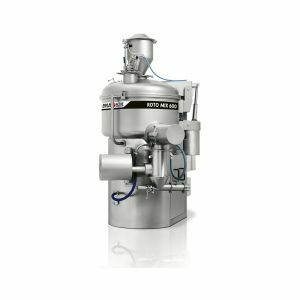 These key features make BDS a versatile accessory for the optimisation of powder and granules handling in the pharmaceutical industry. Designed to allow the testing of HAPI, ZANASI THC is the total high containment machine of the Zanasi series. Combining production safety and versatility, ZANASI THC is the perfect answer to contained capsule filling requirements. Easily moved around in a small space, GS CAR is quick to assemble and remove. 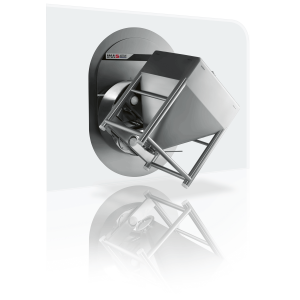 Various types of tank can be interchanged on the same support allowing excellent inspection and sanitation. Take care of your suspension. Smart design, prime performance, enduring reliability. 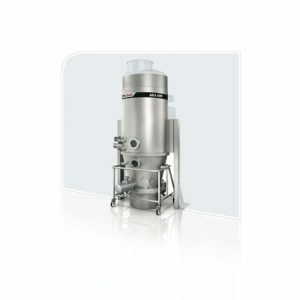 CANGURO’s compact GMP design makes blending smooth and highly efficient, achieving outstanding results with little maintenance. Blending made easy for you. 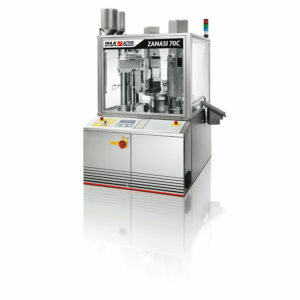 Designed to reach very high speeds, IMATIC dedicates more time to the most delicate phases of the filling process. The continuous movement of the unique turret system has proven over the years to combine precision and reliability. 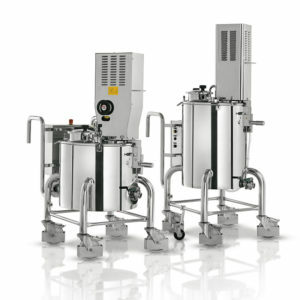 Designed for highly automated installations, GS EVOLUTION represents the ideal base for a contained plant. 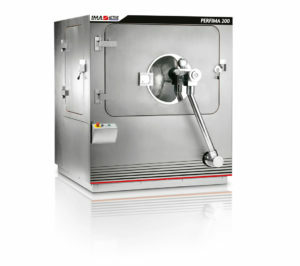 The machine reduces operator exposure in case of the processing of high potent products. Designed according to the most restrictive GMP requirements, PH-BIN and PH-DRUM ensure perfect efficiency with no product losses. 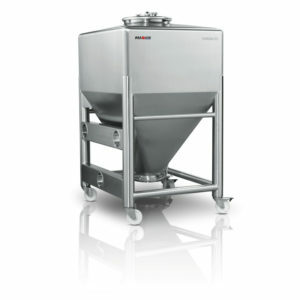 Their large bending radius without dead corners avoids product residue and facilitates cleaning operations. Take care of your products. Exclusively used for the production of Press-Fit® and Xpress-Fit® gelcaps, ZANASI 70C is the ideal solution to produce a unique gelatine-coated tablet. The gel-enrobing technology combines the advantages of the hard gelatine capsule with those of the tablet. 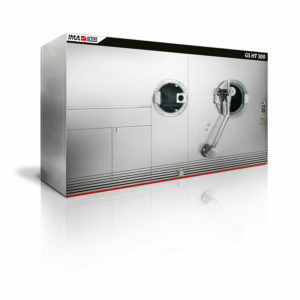 DS71 is a high-speed unit able to handle the entire capsule size range and to remove dust. 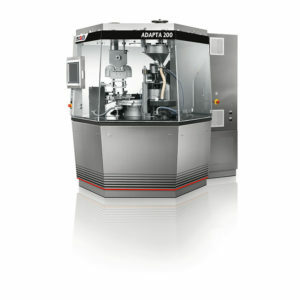 Flexible in height and in feeding speed, it can be easily integrated with all capsule filling machines. 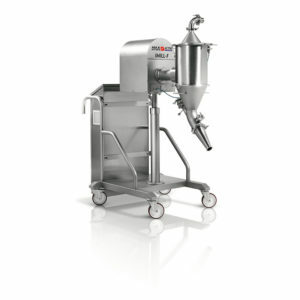 SC SYSTEM capsule feeding and selection device improves capsule fillers’ productivity. 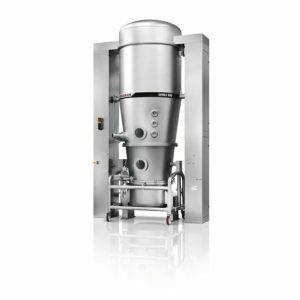 It automatically selects any crushed or ovalised capsule and feeds only the perfect ones into the machine hopper.